FOR SOME TIME WE HAVE LET ALL OUR OPPONENTS VOICE THEIR OPINIONS. EXTERMINATIONISTS, THOSE BELONGING TO THE HEC CULT, THE HOLOCAUST EXTORTION CULT ARE FREE TO VOICE THEIR OPINION. SUCH HOLOCAUST DENIERS AS: CHRISTOPHER BROWNING, RICHARD EVANS, OLAF JENSEN, PETER LONGERICH, DEBORAH LIPSTADT, ROBERT JAN VAN PELT, AND OTHER EXTERMINATIONISTS ARE ENCOURAGED TO VALIANTLY DEFEND THEIR CULT AND NOT CHICKEN OUT WHEN THEIR FAITH IS BEING EXPOSED. YOU ARE GETTING WELL PAYED FOR YOUR RACKETEERING AND IT IS ABOUT TIME FOR YOU TO SHOW TO THE WORLD YOUR MONEYS’ WORTH. The Popes have been refused to see the Birkenau Purification Plant in order to hide the fact that the HEC Cult, the Holocaust Extortion Cult is a complete hoax and a money racket. 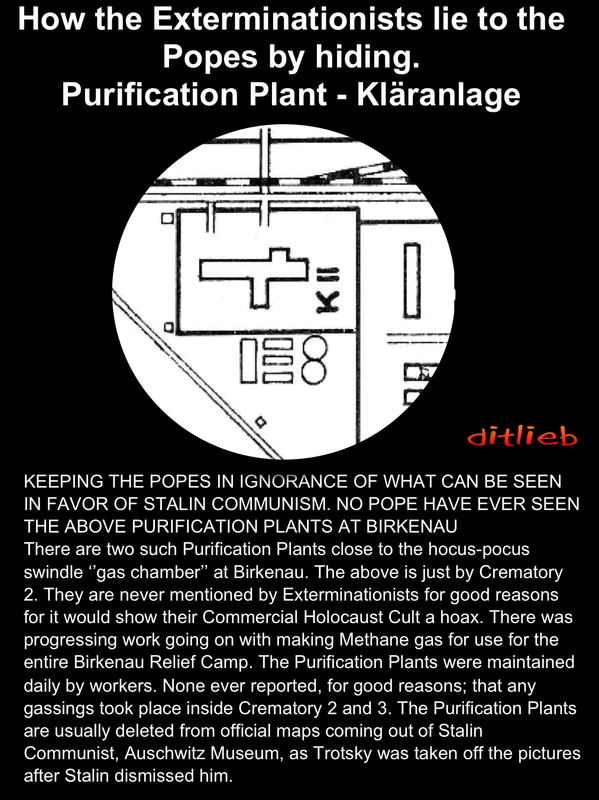 The Klaranlage, the Purification Plant is just close to the alleged and phony ‘gas chamber’, Holy Shrine 2, at Birkenau. ditlieb-radio.com has developed into a veritable pictorial, picture Encyclopedia unrealized before in History. No longer are we bound with pro-Hegel interpretation be that of the Communist or Christian type. By going to the tags and clicking them you find further information on topics you search, people, places, Doctrines, Philosophy, and daily life and awareness.